Traditional villages, churches and towers! Key elements of the unique atmosphere of Mani; combined with the exceptional natural beauty enchant the visitor. There are everywhere in Mani. But even more in Messa Mani, in the south peninsula, where the bare landscapes of stone, the arid land and the intense light come down from the mountain slopes of Mount Sangias to meet the blue sea in steep cliffs and coves. Traditional and bright as the sun reflects on the white stones, Areopoli, the central settlement of Mani, faces from above the Messinian Bay in the west. North the Mount Taygetos rises; south the Mount Sangias at the Mani peninsula. Only towards the east, where the road comes from Gythio, the area is somewhat green. Areopoli is 26 km from Gytheio and 72 km from Sparta. It is located at an altitude of 250 m. Low, in the beautiful enclosed bay, is its seaport Limeni and a little further Itylo known from the Homeric epics as well as the modern history. The road to the north after Itylo leads to Messiniaki Mani. The old part of Areopolis is preserved. In this lies the historic cobbled Square of March 17, 1821 with the church of Taxiarches (Archangels). Here that day the Maniots led by Petrobey Mavromichalis launched the War of Independence and began the Greek revolution releasing on March 23 the town of Kalamata. The Church of the Archangels, built in the 17th century with well worked stones, is cruciform with a ten-sided dome, an arch also of ten sides and beautiful sculptural decoration. It has been declared a protected monument. Protected monuments are also the churches of St. John the Baptist, vaulted with built iconostasis and frescoes of 1746, St. Polycarp, vaulted with a three-sided arch and frescoes of last Byzantine times, the All Saints, in a ruined monastery at the site Xifarianika, vaulted with built iconostasis and icons of folk art, and Panagia (Virgin) Tsipiotissa, in a monastery, two-columned cruciform with an eight-sided dome, built iconostasis and frescoes. Preserved monument is the four-storey tower of Mavromichalis in a large building complex, with a high wall like a fortress. It is the biggest building in the area and for many years was used as school. A preserved monument is also the three-storey tower of Pikoulakis in a two-storey dwelling. Here a few elderly Maniots stopped in 1826 the soldiers of Egyptian Ibrahim, who came to conquer Mani. Then the Maniatisses, the women of Mani, threw them with sickles overboard in the bay of Dyros. There is also the two-storey tower of Kapetanakos. It has been restored as a guesthouse. North of Areopolis the bay of Limeni, or Itylou, is formed; a safe anchorage since ancient times, a pirate-base and with a long history. Into the bay in February 17, 1770 the Russian fleet under Theodore Orlov sailed, during the revolt of the Greeks at the time of the Russo-Turkish War (1768 - 1774). Limeni is the safest natural harbor on the west coast of Mani; small traditional village on the south shore of the bay, 4 km from Areopoli, had great importance the past years as a base for naval expeditions. It is connected to the historic family of Mavromichalis. Here is the tower of the family, the Palace of Mavromichalis. The main building consists of a large oblong dwelling, and a four storey tower, which is the continuation of the south side of the complex. At the time of Petrobey Mavromichalis, the last bey of Mani, here was the headquarters of the Maniots before and during the Revolution of 1821. 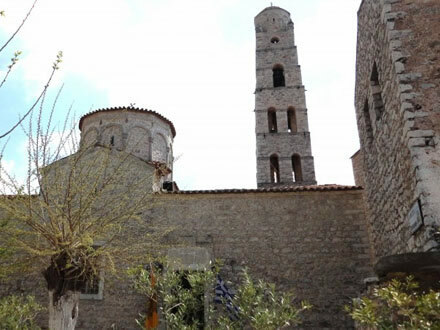 Nearby is the monastery of Panagia Evretrias built in 1731; there is a cross-roofed church with paintings of folk art. In the bay we can enjoy the sea, awarded with the Blue Flag for clean waters. In Limeni, on the south coast, are accommodation and a nice beach; also at the cove of the bay, in New Itylo or Tsipa and in Karavostassi. In the port of Limeni supplies and fuel for yachts. Further north, in the interior, is Itylo at an altitude of 240 m on the location of the ancient city Itylon, the city of Menelaus, as Homer says. Later was a city of Sparta and during the Roman era a member of the League of Eleftherolakonon (Free Laconians), founded by the cities of Laconia. During the Turkish rule was a central settlement of Mani with most residents, the seat of the most powerful families and occasionally a base of pirates. In 1675 local enmities and Turkish pressures led seven hundred and thirty inhabitants to flee to Genoa and settle in Corsica. In the region are the churches of Aghios Georgios and of Transfiguration and the monastery of Dekoulou since the 18th century. East of the bay is the medieval castle of Kelefas. It has a shape of pentagon and five protrusions resembling towers without openings. At a short distance from Aeropoli the main road to the south forks in the settlement of Lagokili. To the east leads to Kotronas in the beginning of the east coast of the peninsula. To the south follows at some distance the west coast. Smaller roads lead to the settlements on the one and the other side of the main road. The western zone of the peninsula is full of villages. After Lagokili we pass at an altitude of 200 m near the traditional village of Haria and a little further we go right on the road leading to Pyrgos (Tower) Dyrou, traditional settlement, too. Around Pyrgos Dyrou are fourteen villages. There are many towers and churches, such as St. Marina, St. John, St. Peter and Archangels. North of the settlement is the bay of Dyros in a beautiful landscape with rock formations and a beautiful beach on the south side. Here the famous caves of Dyros reveal since many years their secrets and attract the admiration of thousands of visitors. 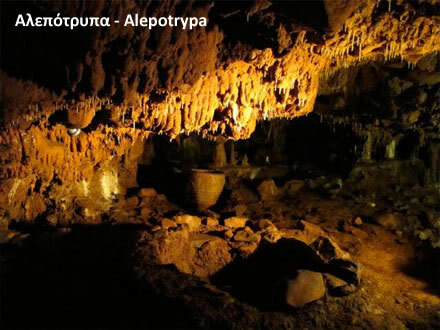 The caves Vlychada of Glyfada, Alepotrypa and Katafyngi are of the most important natural sites in Greece of high archaeological and scientific importance. 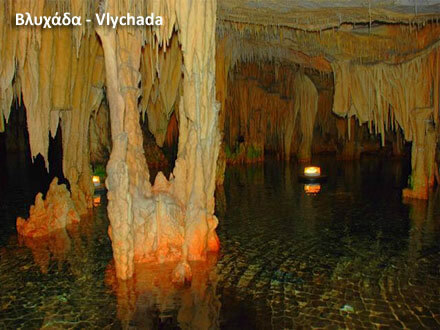 Vlychada is one of the most beautiful lake caves. Its level is almost at sea level and covers an area of ​​33,400 sq m. Its existence was known since 1900 and was first explored in 1949 by John Petrochilos. Passageways of 5,000 m have been explored. The surveys brought to light fossils of animals before two million years. The temperature inside is from 16 to 20 degrees Celsius. The water temperature is 12 degrees. The tour is made by boat and in a part on foot. The tour in the lake part in a length of two and a half kilometers offers unforgettable impressions. The boat glides between stalagmites and stalactites, dreamlike with their reflection in the water. Characteristic are some of the names given to different spaces, such as "pink and white apartments", "fairy hammock" and "red room." Alepotrypa is located at a short distance east of Vlychada. It has an area of ​​6,500 sq m. The land is 600 sq m and the rest an underground river passage. It was discovered in 1958 and explored by the pair of great Greek cavers John and Anna Petrochilos. The average temperature is 19 degrees Celsius and the water temperature 18 degrees. The cave had springs of drinking water and was inhabited since at least 5300 BC. Archaeological excavations began in 1970 by archaeologist George A. Papathanassopoulos and showed that the cave was used during the Late Neolithic period as shelter, housing, laboratory, warehouse for goods, but also as a place of worship and cemetery. Tools of stone, bone and obsidian have been found; also ceramics, weaving paraphernalia, jewelry, pottery and marble figurines, but also human and animal skeletons. 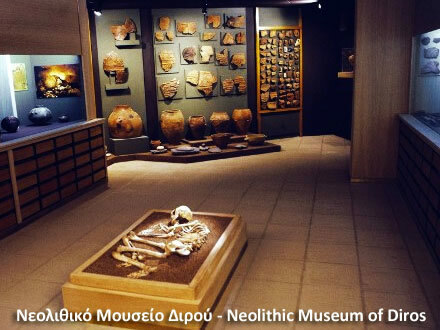 The most representative findings are in the Neolithic Museum of Dyros at the entrance of Alepotrypa. The third cave, Katafygi, is located at a half kilometer before Vlychada and Alepotrypa on the left side of the road. It has an area of ​​2,700 sq m and the length of the passageways is 700 m.
Continuing southward after Pyrgos Dirou the small settlements on both sides of the main road are the one after the other. In the small bay near the village Kouloumi are the interesting caves Alatsospelo and Koukouri. 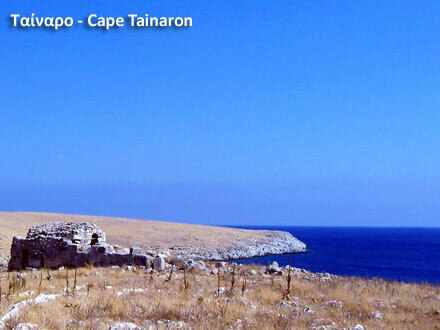 Further the bay of Mezapos is formed, one of the most scenic coastal areas of Messa Mani. In the background is the settlement of Mezapos with a small harbor and a beach for swimming. At the edge of the elongated peninsula which encloses the bay from the west are the ruins of the Byzantine and Frankish castle of Maini. Near the road is the location of the ancient city Messe, famous for the many pigeons. Continuing on the main road to the south we see the images of a very distant and at the same time very close Mani wherever we turn our gaze. Towers everywhere! Most are in the traditional settlements of Nomia and Kita and further south of Lower Boularii and Upper Boularii. Everywhere also small Byzantine churches! In Kita, Saint Procopius, and the Saints Sergius and Bacchus since the 12th century with magnificent decoration; in Boularii, Saint Panteleimon since the 10th century and Saint Strategos since the 11th century. Shortly after Boularii we reach the south coast, in the splendid bay of Gerolimenas enclosed by Cape Grosso. The western area from Mezapos up to Gerolimenas is full of small villages. Near the coast on a steep rock was the ancient city Ippola. 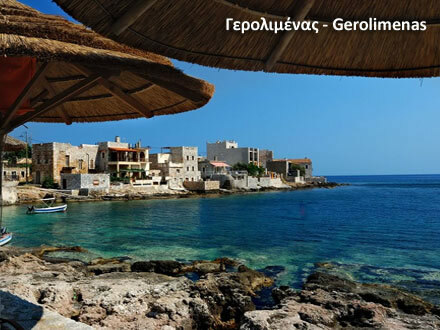 In the cove of the bay, Gerolimenas is a picturesque village and harbor, with a beach for swimming. From here the coast turns southeast followed by the main road leading to the village Alika, where a branch brings to the east coast. On the other side the main road goes further south. From Gerolimenas the main road leads southeast to the settlement of Alika, declared traditional, too. In the vaulted church of St. George are interesting frescoes. From Alika a branch of the main road leads to the eastern coast of the peninsula of Mani. The continuation of the road to the south brings to the southern side of the peninsula that ends at Cape Taenaro. We can know the southern part also by sea with boats sailing from Mezapos and Gerolimenas. 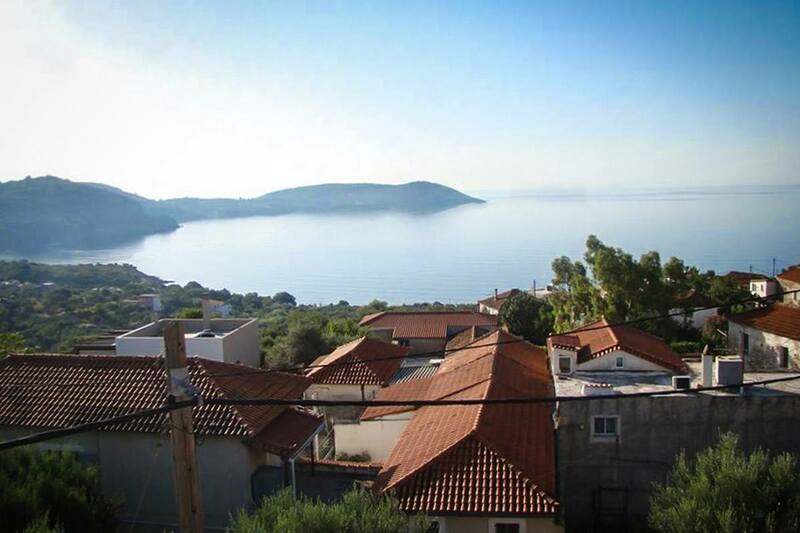 From Alika we arrive southern in Kyparissos, another traditional village with a beach for swimming. Of the many churches three small basilicas from the early Christian period are the most interesting. Near the sea there are remains from the Roman period. On the coast, between Alika and Kyparissos is the location of the ancient Kaenepolis, an important city during the Roman era, when the League of the Laconian cities flourished. 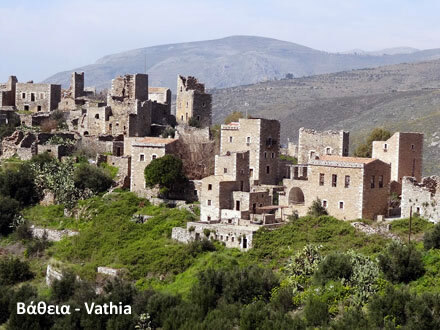 After Kyparissos we reach Vathia, an important village of Messa Mani at an altitude of 190 m. Vathia, also traditional village, is famous for its many towers, many of which have been restored and operate as guesthouses. From here the main road follows the coast to the south, reaches a neck of land – a low isthmus with a width of 500 m – and ends on the east coast, where is Porto Caghio (Cayo), a port in a wonderful bay. The name comes from the Frankish name Port of quail. Quails are gathered in the region before flying to warmer climates. Here was the ancient city Psamathous. Remains of tombs and inscriptions have been discovered. High on the north side there are traces of the Frankish castle of Megali (Great) Maini. The area south of Porto Cayo is a small peninsula like an island with a length of 6 km and the higher point at 314 m. At the edge is the cape Taenaro. A road running from the main road, before Porto Cayo, leads towards there. 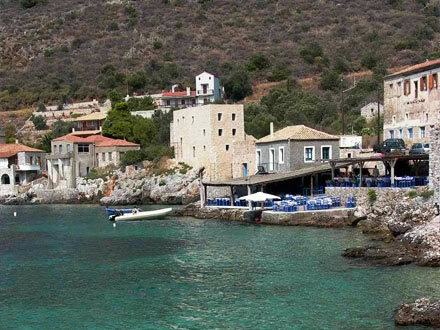 On the west side, at the beginning of the peninsula, is the small port Marmari with a beach for swimming. The road ends at the village Mianes, just before the cape Taenaro. Another road goes after Marmari east to the village Paliros and thence south to the village Kokkinoghia, close to Taenaro, too. 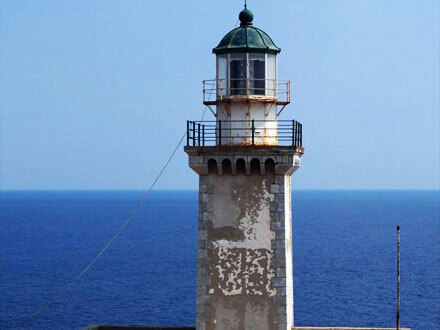 Cape Taenaro, or Cavo Matapas – the Taenaria Akra (Edge) in antiquity – with a great lighthouse, is the southern end of the peninsula of Balkans. On the east coast of the cape was located the ancient city Taenaron, and a famous sanctuary of Poseidon, asylum mainly for helots of Sparta. Hero and founder of the city was Taenaros, son of Zeus. A cave was considered as the entrance to Hades, the underworld, from which mortals communicated with the souls in the bowels of the earth. The legend was not extinguished and the area devoted to the Aghious Assomatous (Holy Bodiless). The ruined church of St. Assomaton is on the coast near the village of Mianes. During World War II, a naval battle took place there, known as the Naval Battle of Taenaron. On March 28, 1941 British and Italian warships were faced; Britons were the victors of the battle. From Cape Taenaro and Porto Cayo we go back to Alika and take the branch in the main road to the east towards the eastern coast of the peninsula of Mani. There is also an internal but difficult road meeting the main road at the point where it turns to the north. On the eastern side of the peninsula, the villages are not as many as on the west side. We can also discover the eastern coast by sea taking a boat either from Porto Cayo to the north to Kotronas, or from Kotronas to the south. From Alika the road leads to the small plateau of Laghia (Laya). Laya, traditional settlement, is located at an altitude of 420 m. In antiquity there were quarries in the area. Then the road descends to the coast reaching the settlement Kokkala with a picturesque harbor and a beach for swimming. A coastal road leads at a short distance south to another picturesque cove where the small village of Aghios Kyprianos (Saint Cyprian) with a harbor and a beach. Near Kokkala inwards are the villages Soloteri and Olympies. Next to Kokkala on the coast is Kotrona, and further north Exo Nymphion with the beach Gialos and a little further the beach at Alipa. In the interior near the village Kourno was the ancient city Aegila. 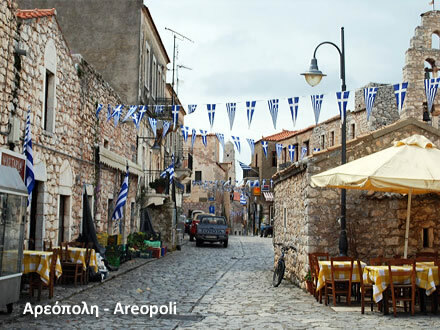 Continuing north we can visit the picturesque villages Argilia and Drymos near the main road. The road leads to Flomochori and then, near Loukadika, meets the road coming from Aeropoli. We turn right to a beautiful bay. 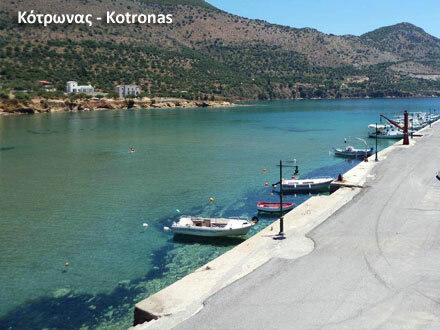 In the cove is Kotronas, traditional village with towers and stone houses, offering good accommodation; its harbor is a safe shelter for yachts. During the Greek Revolution, on July 6, 1826, the Turkish fleet tried unsuccessfully to land troops. From Kotronas we have two choices. Take the road around the peninsula that encloses the bay from the east and passing near the location where the ancient city Tefthroni was to continue north to Skoutari, oOr take the road northwest to Areopoli. In the settlement Chimara a small road leads to the almost deserted villages Riganochora and Gonea, where is the monastery of Soteras. Continuing from Himara to Areopoli we pass by the area where the ancient city Purrichos was located. A beautiful spacious apartment in a former tower building of Mani (1880), with natural light in all rooms ideal for family vacations in the center of Skoutari village.